My personal emphasis (and passion) in Biblical scholarship is New Testament theology through the discipline of Biblical Theology. Over the past couple of years, one of my personal goals has been to develop and share a very simple message that helps the average person understand the New Testament’s big idea. Jesus: The Man in the Middle. Gospel: A call to respond with fealty to the world’s rightful king. Spirit: The eschatological presence of God with his people. Hope: New Creation and the age to come. The first key to understanding the message of the New Testament is to remember that the Bible’s larger story is about God’s plans and purposes for the world, and for the people in it. God’s intention is to see his creation ruled by an image-bearing vice-regent who will rule and reign over all things on God’s terms. The first man, Adam, failed in this vocation, but God promised that his intentions would not be hindered. God himself comes to be what He intends for all people. Jesus, God the son, comes to reverse the course of the human race, refusing to be Adam, and destroying human rebellion through complete submission to God’s will even in the face of his own death on the cross at the hands of sinful people. Jesus is the man in the middle of the Bible’s message. He is the good man, and the pleasing son. Through resurrection, God vindicates Jesus, and seats him at His right hand as the world’s only true King. 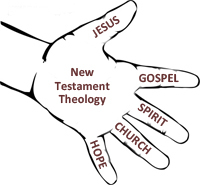 That leads to the second aspect of New Testament theology, and the second key to understanding the whole message of the New Testament. If the Bible is the story of God’s good creation, and his purpose for humanity is to set a human who bears his image over the creation to rule it on his behalf, then the New Testament begins by telling the reader two things: (a) Jesus is the man whom God has set over creation, and (b) therefore we should submit ourselves to Jesus as the world’s legitimate King. For the New Testament writers, Jesus is the man God promised he would send in Gen. 3:15. He is the man in the middle of the story. The Gospel is the good news — a royal proclamation and regal announcement — of that message, and the corresponding call to all people to give fealty to King-Jesus. But there is more to the central message of the New Testament with respect to what followers of Jesus can expect once they join his kingdom. The third component in the cohesive message of the New Testament is that the Holy Spirit, because of the ministry of Jesus, has been poured out upon all of God’s people, and thus He is with them, working through them, and empowering all of them until the end of the age (cf. Joel 2:29; Acts 2:17). Through Jesus, the access to God’s life-giving Spirit has been opened, the veil between heavenly and earthly realities has been torn, and the place of humanity at God’s right hand has been re-established. God is with his people again, and will be with them from now on. Therefore, the following and final two sections bring the message of the New Testament to a crescendo by answering two important questions: Now what, and then what? The basis for Jesus’ instructions to his disciples is the first aspect of the message of the New Testament discussed above. According to Jesus in Matthew 28:18, God himself has turned the entire creation over to Jesus, and given him the right to rule over it. Thus, his followers, empowered by God’s Spirit, take up the task of gathering people from every ethnicity back to relationship with Israel’s God through submission to the world’s rightful Lord, Jesus. In Jesus, Abraham’s descendants become more numerous than the sands of the sea not on the basis of their genetic relationship to him, but on the basis of their trust in God. God’s mission to bless the nations, therefore, continues under the Lordship of Jesus through the expansive witness of the Jew-Gentile church! Where is this project headed? What does the future hold? The ultimate destination, the telos of this world-blessing project is the focus of the fifth and final aspect of this post, as well as the crowning message of both the larger story of the Bible, and the specific message of the New Testament. According to the Apostle Paul, New Testament followers of Jesus have a “blessed hope” (Titus 2:13). They have a future, and all of history is moving toward that sure future (Eph. 1:10). The story of the New Testament does not end with the resurrection of Jesus or the earthly ministry of the Church. Instead, it ends by encouraging followers of Jesus to fix their hope on the ultimate restoration of the entire creation – pointing to the resurrection of Jesus as the forecast of what God intends for everyone who submits to Jesus Christ as Lord. The story of Scripture is the story of God and his covenant with his creation. In particular, it is the story of his will to have this world ruled by a human image-bearer who loves him and who cares for the world on God’s terms. It is the story of human failure and abdication, and satanic usurpation, and of God’s commitment not to abandon his creation nor the human race that he created in his image. It is the story of God’s election of certain persons and a certain people through whom God would restore his relationship to all people, and renew and re-pair the creation to him again. It is the story of Israel’s failure, and God’s commitment to fulfill his promise through Israel. Jesus, Gospel, Spirit, Church, and Hope. Now, that’s a New Testament theology you can get your hands on! Finally, I encourage you to try sharing this message with a friend. My sense is that as you do it, you’ll find it much easier to actually share the message of the Gospel with just about anyone you talk to.